This is Skoda looking at vehicles such as the Range Rover Sport, Porsche Cayenne and BMW X5 and saying ‘nope, our way is better’. 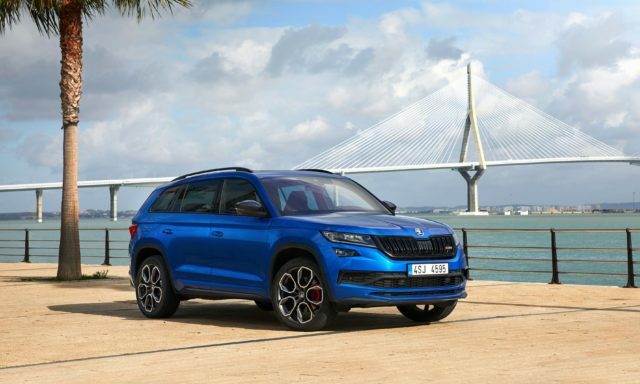 Skoda is already very good at making SUVs – its Kodiaq and Karoq are serious class contenders – while its vRS performance division has a small but very loyal following. 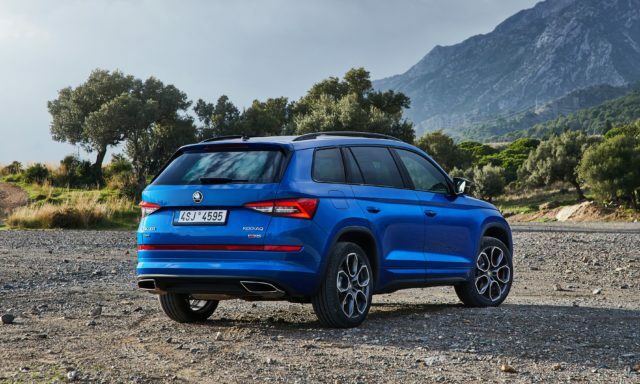 The obvious solution, then, is to combine the two and let vRS loose on the largest car on Skoda’s range – the Kodiaq SUV. Diesel isn’t necessarily the obvious choice for a performance car, but given the sacrifices in fuel economy and running costs it would have meant to fit a petrol into this heavy seven-seater, it’s the best choice. The 2.0-litre twin-turbocharged unit pushes out 237bhp and 500Nm of torque – healthy outputs, if not exactly the biggest. Four-wheel drive and a seven-speed dual-clutch gearbox come as standard, and 0-60mph is dealt with in 6.8 seconds – only around 0.6 seconds slower than a Volkswagen Golf GTI. As for fuel economy, a claimed 35.3mpg on the WLTP testing cycle is, in our experience, optimistic. Driving carefully a 30mpg average is possible. 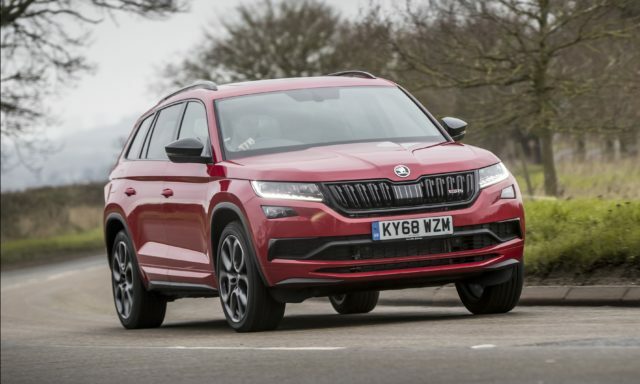 Diesel, 4WD and an automatic gearbox isn’t the ideal recipe for an involving drive, but Skoda’s done well in keeping the big Kodiaq tidy in the bends. It controls its body really well, and thanks to that four-wheel drive traction doesn’t step out of line easily. It’s not all that much fun, though – certainly not in the way a Porsche Macan is – but the payoff is that the Kodiaq’s a truly excellent cruiser. The ample in-gear shove makes light work of overtakes, and while the ride is firm at low speeds it’s very comfortable on faster roads – aided by supportive sports seats. As a fast family bus, then, there are few vehicles that will do the job this effectively. Those looking for hot hatchback thrills, go elsewhere. The Kodiaq’s always been a smart-looking thing, and the vRS is no different. The brand’s trademark sharp-edged styling and mustache-style family grille are present and correct, and the car’s neat rear end doesn’t have the bulky look of some seven-seat SUVs. Some may be disappointed to see that the vRS treatment hasn’t added a lot of bold styling details to the Kodiaq, though. Despite the smart 20-inch ‘Xtreme’ alloy wheels and red brake calipers, this is still a car that flies under the radar thanks to its largely standard bodywork. 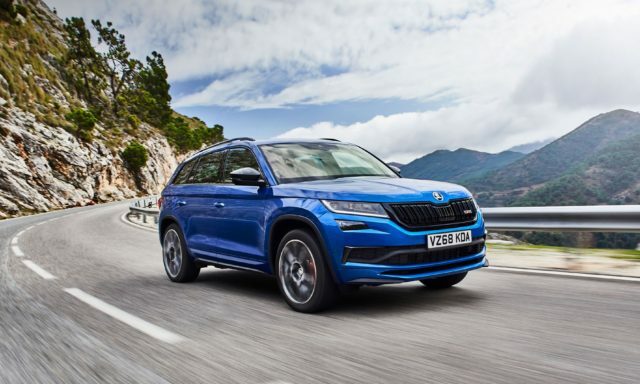 Our test model did come in the standard ‘Race Blue’ paintwork, though, which we love – though many of the other shades lean towards the monochrome, making the Kodiaq vRS even more discreet. As with the outside, the styling team’s been kept on a tight leash in here. While there’s a little red stitching and carbon-fibre trim, it’s quite subtle – the biggest changes come in the form of Alcantara door cards and beefy sports seats. Material quality is excellent and, as with all Skodas, the cabin layout and controls are a model of common sense. 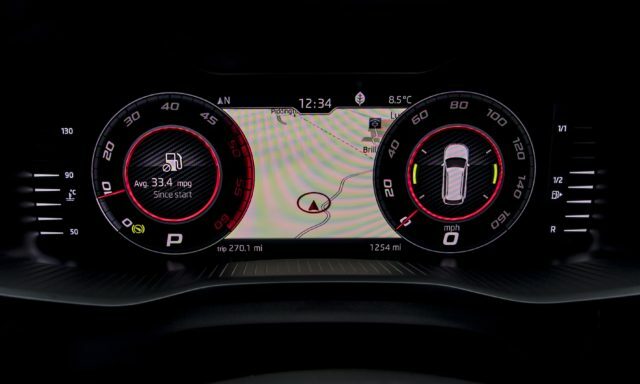 The central touchscreen infotainment system is great to use, while the car’s standard digital gauges are bespoke to Skoda and can be configured in several different ways. There’s also plenty of space – though the third row is more suited to children than full-grown adults, the middle row is very spacious and there’s lots of room in the boot. The seats also fold totally flat. Sitting at the top of the Kodiaq range – the vRS costs more than £42,000 – you’d expect the vRS to be near enough fully loaded. 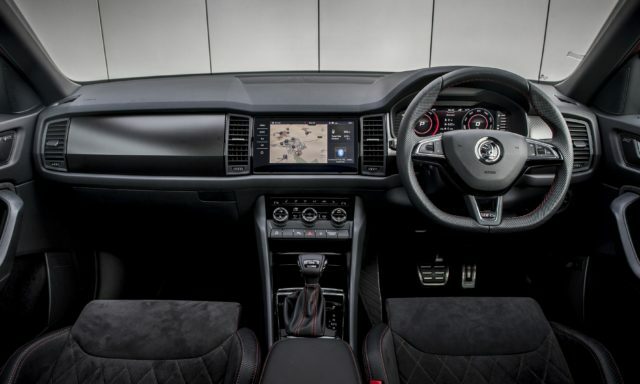 And to an extent, it is – dual-zone climate control, Skoda’s top-end infotainment system with sat-nav and smartphone connectivity, cruise control, and a ‘virtual cockpit’ digital dashboard all come as standard. However, finding electric seats, blind-spot monitoring, adaptive cruise control and a reversing camera relegated to the options list does sting a little. You’ll find them all on the Kia Sorento. Simply put, you’re paying a fair bit for those vRS tweaks – and there are many who won’t want to justify this price tag on what’s still, in essence, a budget brand. 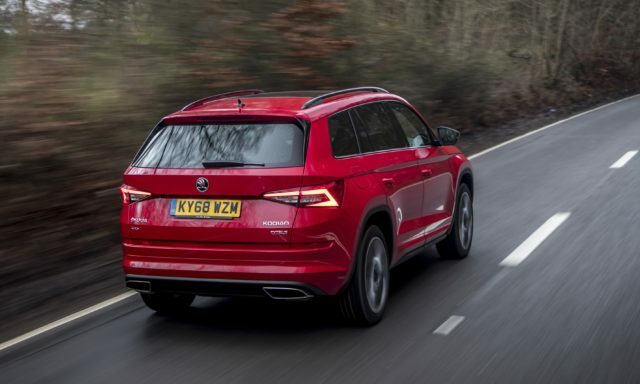 Skoda hasn’t made the ultimate performance SUV here, but it wasn’t trying to – instead, it’s come up with a car that’s great to cruise in, has more than enough performance for most and can still hustle down a back road at hot-hatch pace, all in an unflustered, unflappable kind of way. It’s not the last word in driver thrills but there’s a lot to recommend this car as a bahnstorming family bus, provided you don’t have any issues with its high price tag.